Community events and activities for the weekend of May 6 – May 8. Got an event we didn’t know about? Please add it in the comments! Community events and activities for the weekend of April 29 – May 1. Got an event we didn’t know about? Please add it in the comments! Oakland designer Zoe Hong is a 31-year-old emerging fashion talent in a region rarely recognized for its style. Hong is currently working on her third season, a 10-piece mini-collection for summer, and is planning a larger collection for Fall. She sells her creations at Etsy.com and Kreeya.com, as well as in three boutiques, including The Factory in San Francisco. Community events and activities for the weekend of April 15 – 16. Community events and activities for the weekend of April 8 – 10. Got an event we didn’t know about? Please add it in the comments! From ‘April Ful’s Night’ to the Habitat for Humanity warehouse liquidation sale, Oakland North knows what’s up this weekend. The Oakland Running Festival is in its second year, and 7,284 runners representing 35 states and six countries registered for one of the weekend’s five races – the marathon, half-marathon, 4-person team relay, 5K, and kids’ fun run – up about 20 percent from last year. In the 2011 season opener for the Oakland Outlaws, Oakland’s own roller derby team, the Outlaws face off against the Berkeley Resistance, the newest team to be added to the B.ay A.rea D.erby (B.A.D.) Girls Roller Derby league. Community events and activities for the weekend of March 18 – 20. Got an event we didn’t know about? Please add it in the comments! Community events and activities for the weekend of March 11 – 13. Got an event we didn’t know about? Please add it in the comments! 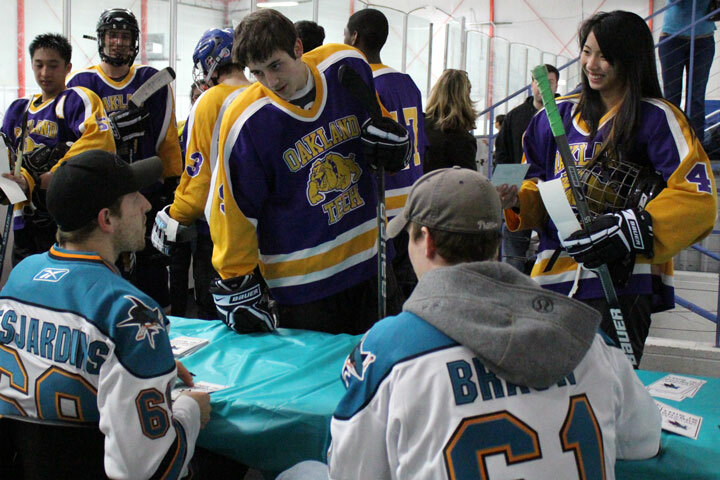 It’s Monday afternoon, and most of Oakland Technical High School’s ice hockey team—in full pads and bright purple and yellow uniforms bearing their Bulldogs logo—have hit the ice for a special skills clinic led by Justin Braun and Andrew Desjardins, players for the San Jose Sharks. It was early, raining and Sunday, but about 300 people still gathered in front of the Oakland Marriot City Center last weekend for the final official training run for the Oakland Running Festival’s marathon and half-marathon races.